Enoch Powell's name meets with spontaneous applause. Mention of David Cameron or Tony Blair prompts derisive laughter. This is the UKIP conference hall, a place united against its enemies. In the foyers outside, though, things are different. One stall is fronted by Marta Andreasen - a sitting UKIP MEP - who has called for the leader Nigel Farage to resign. Another promotes the cause of Nikki Sinclaire, who was elected as a UKIP member but now sits as an independent in the European Parliament. She claims Farage has fallen out with half of the MEPs in the party's history, adding: "We can't all be wrong." Then there is UKIP's founder Alan Sked, who wrote to the The Times to say: "UKIP has been fooling its voters and members for far too long. Its third-rate leaders, propagandists and MEPs all need to be sacked and the party re-established." In the wake of an English local election campaign that saw the party emerge with just seven seats, discontent is easily found. And yet, in the hall they feel differently. Mr Farage's speech, which includes a call for an English parliament, is interrupted by cheers, shouts of "Yes!" and occasional whooping. Far from struggling, Mr Farage says UKIP is making "good, solid and steady" progress. He cites a recent opinion suggesting it would attract 7% of the vote at a general election, and prove the fourth most popular party. He attacks the prime minister, extols new limits on immigration and decries cuts in the armed forces, as well as making the case for withdrawal from the EU. There is, of course, a standing ovation. For the first time, though, Mr Farage has a competitor for the title of best-known man at conference. Onetime Conservative MP Neil Hamilton - recently reborn as an Edinburgh festival performer - is here, and he wants a place at UKIP's top table. Mr Hamilton is attempting to jumpstart a political career ended by the cash-for-questions scandal as a candidate for the party's national executive committee. Three times during one brief interview he is interrupted by fans wanting to shake his hand. "I won Ready Steady Cook twice!" he cheerfully tells an autograph hunter. Sporting a union flag bow tie he says he had made for the campaign against membership of the European Economic Community during the 1975 referendum, he says: "I'm a resource to be used for whatever they think is useful." Mr Hamilton does not deny he might try to stand for the European Parliament under UKIP's banner, but says he does not have designs on Mr Farage's job. "I'm no Robert Kilroy Silk," he says, citing the daytime television star who once aspired to lead the party. And Mr Hamilton continues to deny accusations he accepted cash to ask questions in the House of Commons during his time as an MP, saying he was "whiter than white". 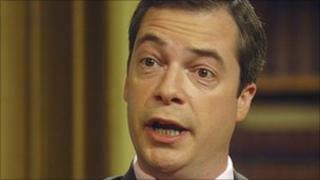 Mr Farage admits Mr Hamilton brings "baggage", but promises to support him in the national executive committee election. So which is the real party? The one that that came second at the last European elections cheering its leader's speech, or the bickering group that numbers council election gains in single figures, despite a knack for attracting television personalities of a certain age? UKIP's call for withdrawal from the EU remains popular at European elections, and his party has a known political brand. From these flow its support, its MEPs and its media profile. The charge put by its deputy leader David Campbell Bannerman when he defected to the Conservatives in the wake of the May elections was that UKIP remained, at heart, a single issue pressure group. As ever the party is trying to widen the scope of its policies and its electoral success. For Nigel Farage convincing his fiercest critics among UKIP's members and its estranged onetime supporters that he remains the right man to lead the party may be difficult. Convincing the public his candidates deserve places in council chambers and even the House of Commons, could prove an even greater challenge.